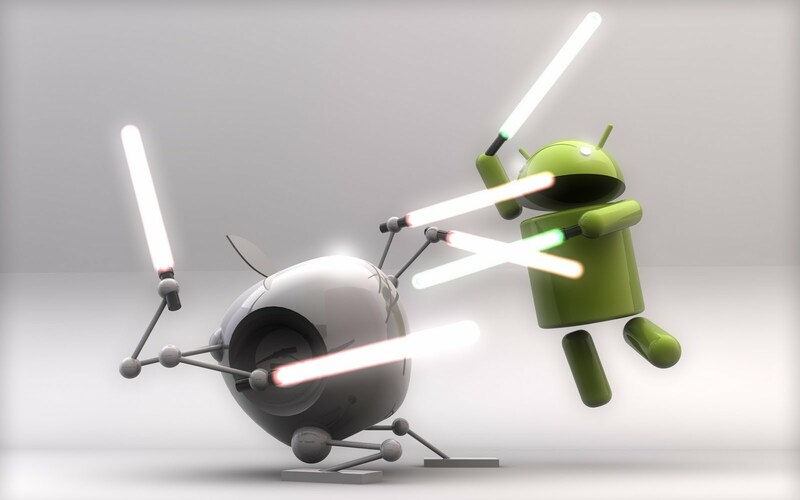 In the ultimate pinnacle of first-world disputes, the epic battle of iOS versus Android boils on as the mobile market continues to turn out new devices. People seem to have intense opinions about their operating systems, usually stemming from the owership of one smartphone without without having tried the other. But basically the debate boils down to usability versus features- the Apple team has dedicated themselves to convenience for the majority of users, often at the expense of added elements, while Android touts feature-rich devices that may confuse the basic layman. Apples' strategy to win is by making the best phone for most people. Sometimes, this means adding the latest and greatest technology, but there are many instances, depending on your market, when it's best to remove, not add. The iPhone has an easy to navigate user experience, and has a sleek design. It appeals to many, and many prefer ease-of-use over all the fancy hardware. IPhone fans feel that much can be achieved with the minimum amount of hardware, but with its well thought out software and features, there's no contest. Those in this ballpark don't mind that it is not customizable; they're more aprreciative of the simplicity and reliability of the iPhone. Depending on what side of the fence you're on, maybe you appreciate this intuitive ease of use that iPhones provide. On the other hand, mabe you're more a advanced user and like to be able to have options to tweak and personalize to your heart's content. Android operating systems have a whole plethora of features that appeal to the geek in you. Modifications can be made anywhere, and the customization ensures phones that are as uniqe and uncommon as each person. Apple's design ideas have carried over into the general world of all smartphones, and you can see their influence in the aesthetic similarities across the board. Apple has always prided themselves on great design, but Android has emulated that aesthetic very well, adding extras that the iOS has sacrificed. Apple does not allow operators to pre-install software on their phones or modify the operating system. Apple doesn't have external storage support. Apple doesn't expose the file system. Apple says it knows best when it comes to how your homescreen should look. You still can’t delete the Stocks app, for reasons known to nobody. You can, at least, delete the U2 album. You cannot install apps that record your phone calls. Apps that are not deemed well-designed are rejected from the Apple App Store. Apple does not allow you to download big items over 3G, and does not allow you to turn that setting off. All these things will be seen as negative by the percentage of users that are advanced, but Apple is intentionally throwing that target market to the flames to make the experience better for the rest. Apple is definitely not obsessed with building the most featured products, but offering the best possible user experience to the widest base of consumers. This isn't to say that they have an edge on the maket- Apple's iOS has only around 11.7% of the market share, while Android clocks in at 84.7%. Together, iOS and Android take up 96.4% of the market (sorry, Windows phone). With such a huge proportion of all smartphones out there, people can fight all day about which is better, but ultimately it depends on the user, and we don't see any real competition coming for them any time in the future.